Probability to win in a lottery is what we believe in, but in 99% of cases it doesn't happen with us. Only 1 of these reasons is real, I think you’ve already understood that it is not your luck or eternal stars. Today any lottery isn't a transparent mechanism, and her organizers don't use subway and don't fly coach. • It’s impossible to watch the process of conducting a lottery and to check its reliability and transparency. And these are only general data, without much detail and complete analytical description of the process. Fortunately, we live in an era of cardinal changes in the world. These changes are caused by development and promoting of the Blockchain technology. With the help of which it is possible to achieve full transparency and trust to different processes. RANDOM is the fairest lottery from all existing at the moment. The work of RANDOM is organized completely on the basis of the Ethereum smart contract that allows to exclude the human factor and organizers’ fraud completely. The only one task of creators is to do marketing for the project and provide the technical means allowing participants to obtain information and to follow the process. 1) Receiving ETH and freezing it on the smart contract. 2) Transferring 10% of the funds raised (from each lottery) to the smart contract for distribution between marketing and support goals. For activities of RANDOM it is necessary to use promotion channels and also to involve specialists who provide development and technical support of the applications (used for displaying of the process and results of a lottery). 3) Instant distribution of 90% of the prize fund. 1) In everyone lottery 4% of the participating tokens win. 2) The senior Jackpot – 10% of the prize funds, average Jackpot – 4%, junior Jackpot – 1%. 3) After Jackpot drawing, the remaining ETH is equally distributed between other winners which constitute together with Jackpot winners 4% of all participating tokens. where X is a number of the participating tokens. In the case of repeated participation, chances for winning are increasing in proportion to the number of participations by the formula: 0,04*n, wherein N is the number of participations in the draw. Therefore, the chance for winning at the 10th participation is 40%, and the total winning volume would be twice more than the volume of invested funds during all the time. RANDOM Token (RND) is an exclusive utility token, it is its task to be chosen or not by randomizing algorithm based on the hash function of the block. The lottery starts with the certain block number and finishes as soon as the block appearing in approximately 1, 7 or 30 days is appearing is reached (for different types of lotteries). It is allowed to bet starting from the moment of the lottery start. Each bet creates a new lottery ticket (the amount of lottery tickets is calculated on the basis of the unit price at 0.01 ETH per ticket). With the end of the lottery (when definite block of the net is reached) it is necessary to commit "the final bet". The winners are being determined as a result of "the final bet". The balance of each winner is being increased by the amount of the prize. In any moment after the draw, a winner is free to withdraw ETH out of the balance using "Withdraw" function. The winning can be accumulated at the contract for unlimited time and can only be withdrawn by the winner. Take part in the fair lottery. Win with RANDOM! Hello! My name is Mr.R. I am an official representative of RANDOM. The work of RANDOM is organized completely on the basis of the Ethereum smart contract that allows excluding the human factor and organizers’ fraud completely. In the nearest future launching of RANDOM, where anyone will be able to take part in a Blockchain-based lottery and to try his or her luck, will be announced. Full disclosure of process and decentralization is how RANDOM differs from ordinary lotteries where greedy companies make money off ordinary people. Founders of RANDOM have no names. They have challenged and are ready to fight for a transparent, decentralized and fair world within lotteries. Participate, support, fight and win together with RANDOM. We will consider the process of a Monthly lottery individually. The Monthly lottery of RANDOM is organized on the Ethereum Blockchain with the use of a contract smart. The smart contract is publicly available, anyone can analyze it on github.com or examine the audit by IT companies specialized for this purpose (audit will be published on the RANDOM’s official site in the nearest future). The functionality for conducting lotteries is provided entirely by the use of smart contracts. All currency in ETH which are sent to the smart contract is frozen till the end of a lottery. A lottery is performed instantly at the moment when a certain block with the frequency specified in the smart contract appears. 90% of the prize fund are distributed between winners, 10% of the funds are transferred to the smart contract for distribution between marketing and support goals. In a Monthly lottery 4% of the participating tokens win. In a lottery Jackpot is used. The senior Jackpot – 10% of the whole prize fund, the average Jackpot – 4%, the younger – 1%. After Jackpot drawing, the remaining ETH is equally distributed between other winners which constitute together with Jackpot winners 4% of all participating tokens. For reference: Average % of probability of winning a prize in a usual, not connected with the RANDOM lottery - 1/60 000 000 (0.0000016%) that is almost impossible within participation. 2. Choose the Monthly lottery and press the button “Participate”. 3. In the instruction appeared on the webpage copy the contract address. 5. Transfer the Ethereum amount which is necessary for you to the copied contract address. 6. Automatically, after receiving ETH on the RANDOM contact address, on a payer’s wallet the purchased amount of RND tokens is transferred. 7. Each RND token participates in a lottery as a separate "lottery ticket". 9. You can move RND token - for this purpose follow the instruction for transferring the RND tokens given on the official RANDOM site (the tokens can be used as a gift, for example). 10. Betting is allowed from the moment of the lottery start. Each bet creates a new lottery ticket. 11. At the end of a lottery (the specified network block is reached), you can make "The last bet". This bet will be followed by determination of winners. The balance of each winner on the contract will increase in the amount of the prize. Every participant of the Monthly lottery can make "The last bet". 12. The participant of a lottery who has made "The last rate" is guaranteed from 1 to 5 ETH as compensation for the spent Gas (commission) because the commission when making "The last bet require a higher amount of Gaz. 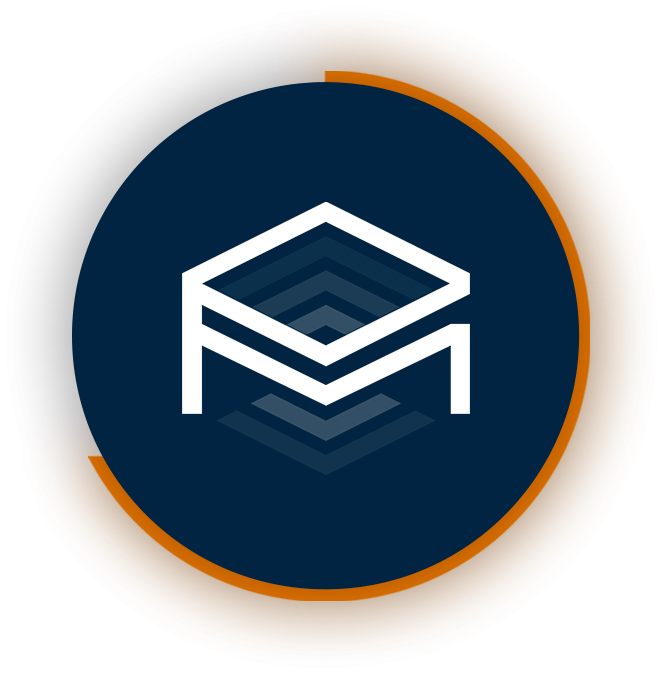 mart contract by using the Withdraw function on the official RANDOM site https://mr-r.io/, following the instruction given in the appropriate section. RANDOM is a lottery working on blockchain. Its uniqueness is very simple — it is the fairest lottery in the World. It is possible because the process is being carried out using Ethereum Blockchain. It uses Smart Contracts, it fully excludes the human factor. RANDOM platform uses RND Tokens instead of lottery tickets, the cost of one RND Token is 0,01 ETH. Join daily, weekly or monthly lotteries. RANDOM — the first truth in your life. We will consider the process of a Weekly lottery individually. 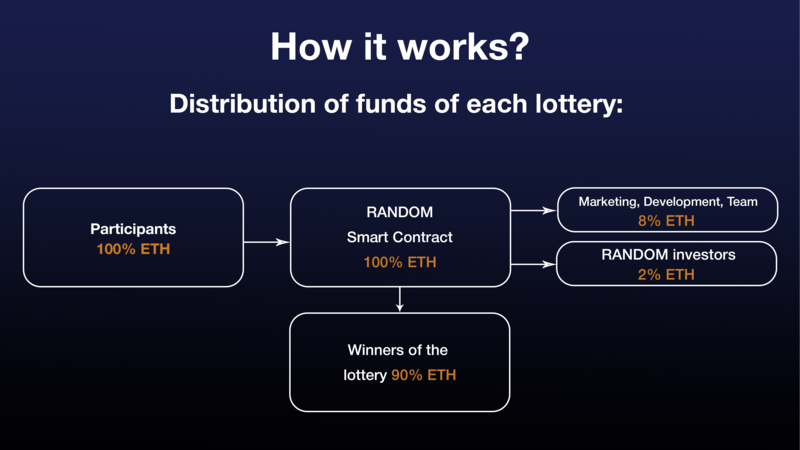 The weekly lottery of RANDOM is organized on the Ethereum Blockchain with the use of a contract smart. The smart contract is publicly available, anyone can analyze it on github.com or examine the audit by IT companies specialized for this purpose (audit will be published on the RANDOM’s official site in the nearest future). In a weekly lottery 4% of the participating tokens win. 2. Choose the Weekly lottery and press the button “Participate”. 11. At the end of a lottery (the specified network block is reached), you can make "The last bet". This bet will be followed by determination of winners. The balance of each winner on the contract will increase in the amount of the prize. Every participant of the Weekly lottery can make "The last bet". 13. At any time after the end of the Weekly lottery, the winner can transfer the ETH he or she won from the balance on the smart contract by using the Withdraw function on the official RANDOM site https://mr-r.io/ following the instruction given in the appropriate section. Anonymous project RANDOM, presented as the lottery based on Ethereum blockchain, announces the limited distribution of the investing tokens among interested parties of crypto society and crypto funds. The process of token distribution will be implemented in the form of Initial Coin Offering, offering an opportunity to buy a limited amount of investing tokens. The process of token distribution will be implemented in the form of Initial Coin Offering offering an opportunity to buy a limited amount of investing tokens. Token holder receives permanent remuneration in Ethereum cryptocurrency from directing each of Random lotteries - 0.001 %. The payments are committed automatically using the smart contract without any sort of interference by the Team. Payments are made as long as RINVEST token is being kept at a wallet of its owner. RINVEST is ERC20 Token. There is a possibility to commit transfer or sale of the token at trading platforms. The amount of RINVEST tokens is limited to 2 000. Additional emission is not foreseen. 1. It is necessary to exchange cryptocurrency BTC, ETH, BCH, LTC, DASH (on the choice) at Random official site https://mr-r.io/ To become RINVEST holder. 2. The period of token receiving after an exchange is 12 hours. 3. The cost of one RINVEST Token is 1,000 USD. The token can only be sent to its owner in the expression of integer number. 4. The period of token sale is not limited. 5. Maximal amount of collected funds is 2,000,000 USD. Hard cap is not set. 6. All the funds collected via RINVEST Token sale will be used for marketing and PR purposes for increasing the blockchain-based lottery Random participants number. Date of ICO Random start (RINVEST) is set on February 2018. Twitter @Mr_Random_io or at official website https://mr-r.io/. 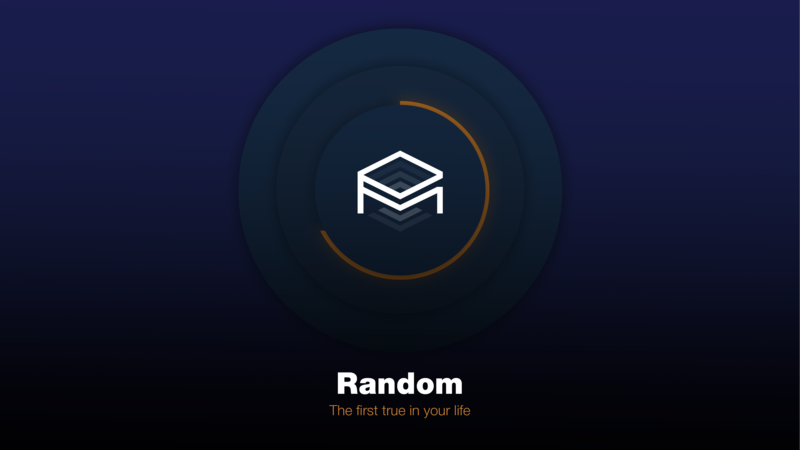 RANDOM is a lottery based on blockchain. Its feature is that RANDOM is the fairest lottery in the world. it is achieved by the fact that the whole process is based on Ethereum blockchain with application of smart contracts. It allows to fully exclude the human factor. RANDOM interface uses RND token as a lottery ticket. Its cost is 0,01 ETH. That is why I, Mr. Random, decided to organize an ivent for Crypto Community. Taking part in my AirDrop you will get 1 lottery ticket — RND Token. You can use it for taking part in the weekly RANDOM lottery (April 11 — April 18, 2018) and get a chance to win Ethereum cryptocurrency (ETH). Minimal Prize fund is 9 ETH. 90% of the collected funds form the prize fund — the minimal amount is 9 ETH. Average winning of each ticket left is 0.099 ETH. This is a beutiful chance to win 0.9 ETH or even more! How to become a participant of my AirDrop? 4. Share this article or write a post about it. In the end of the week, when a definite Ethereum block is reached, the first Random lottery will be conducted! 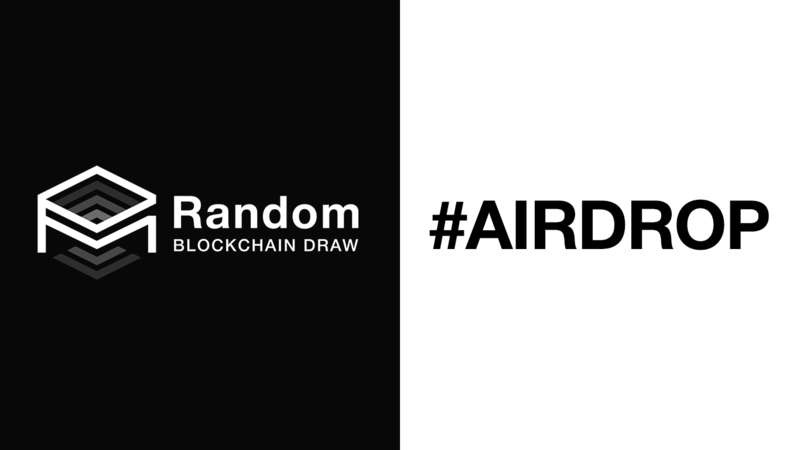 The term of RANDOM AirDrop: April 11, 2018 — April 18, 2018. RANDOM is the fairest lottery from all the existing at the present moment. It is fully powered with blockchain. It fully works on Ethereum smart contract. It allows to exclude the human factor and various frauds on the side of organizers. Full transparency of the process and decentralization — these are the features that differ RANDOM from all the classic lotteries used by greedy companies making billions by simple people’s living. RANDOM founders don’t have names or faces. They went up against the system and staying ready for a fight for transparent, decentrolized and fair world in the context of lotteries. Take part, support, lean into and win together with RANDOM. How to confirm your participation in AirDrop? 3. Link to an article about RANDOM, posted in media or social networks. Its uniqueness is very simple — it is the fairest lottery in the World. It is possible because the process is being carried out using Ethereum Blockchain. It uses Smart Contracts, it fully excludes the human factor. RANDOM platform uses RND Tokens instead of lottery tickets, the cost of one RND Token is 0,01 ETH. Join daily, weekly or monthly lotteries! RANDOM — the first truth in your life. Anonymity of good is height of chivalry, anonymity of evil is height of meanness. We are glad to announce that the RANDOM project will be released very soon. We, the team of developers from different corners of our planet, have done our best for every RANDOM participant to have an opportunity to try his luck with the first absolutely transparent and fair lottery based on the Ethereum Blockchain. After the start our team won’t be able to influence the course of events any more, everything will happen entirely in an autonomous and decentralized way. We strongly hope that you will get lucky. There you can find chats, forums and also the open-source code of the project. RANDOM has no verified founders. Our names will tell you nothing. But we can assure you that you can trust RANDOM just like you trust the Blockchain. The only contact person of RANDOM is Mr. R.
And remember, only you decide to be a part of the fair and transparent world with RANDOM or to support the world of deception and lie. Do you want some Ethereum for free? Then join my AirDrop! 4 - Share this article or write a post about it. The process of token distribution will be implemented in the form of Initial Coin Offering an opportunity to buy a limited amount of investing tokens. - Token holder receives permanent remuneration in Ethereum cryptocurrency from directing each of Random lotteries — 0.001 %. - The payments are committed automatically using the smart contract without any sort of interference by the Team. - Payments are made as long as RINVEST token is being kept at a wallet of its owner. The amount of RINVEST tokens is limited to 2 500. Additional emission is not foreseen. 3. The cost of one RINVEST Token is 1 ETH. The token can only be sent to its owner in the expression of integer number. 5. Maximal amount of collected funds is 2 000 ETH. Soft Cap is not set. 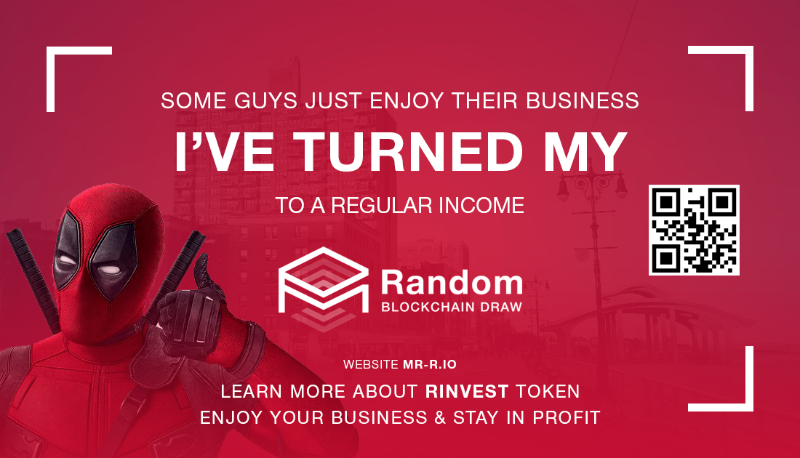 For more information check out news at official Mr.Random Twitter @Mr_Random_io or at official website https://mr-r.io/. Dear friends, since there were less than 1000 applications to participate in AirDrop, I decided to extend AirDrop for one more week. That’s why you still have time to invite your friends to participate in my safe Random lottery. I remind you that AirDrop members get their first lottery tickets for free! Time limits of the RANDOM AirDrop — from April 11, 2018 to April 25, 2018.